It's the final week of the NHL regular season. The Stanley Cup playoffs begin Wednesday. But before we look ahead, let's look back. On this week's episode of the Hockey Night In Canada podcast, we look at some of the major storylines from this past season. 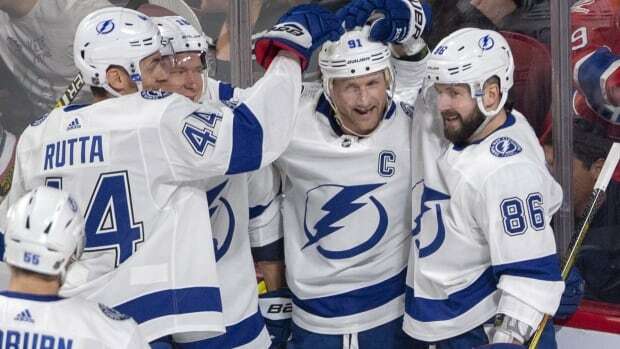 The Tampa Bay Lightning became the third team ever to hit the 60-win mark, joining the 1995-96 Detroit Red Wings and the 1976-77 Montreal Canadiens. They are almost 20 points ahead of the second place team and they have three players with 90-plus points (Nikita Kucherov, Steven Stamkos and Brayden Point). It's been an historical season for the Bolts. For the first time since the 2005-06 season, the NHL will average over six goals per game. Five players this season will finish with 100 points or more. That's the highest total since the 2006-07 season when seven players reached that mark. As of March 29, there have been 497 comeback wins this season. That is the seventh most in a single season in the league's history. Former Calgary Flames general manager and current TSN director of scouting, Craig Button, drops by to discuss these story lines and gives us his take on why scoring is up in the NHL. Another major story line was Alexander Ovechkin. For the eighth time in his career "Alexander the Great" hit the 50-goal plateau. For the eighth time in his career, he will lead the NHL in goals. Ovechkin now has 658 career goals. Does Ovi have a realistic shot of passing Wayne Gretzky's mark of 894? Dom Luszczyszyn of the Athletic joins host Rob Pizzo to discuss why he thinks Ovechkin becoming the all-time leading goal scorer is a very attainable feat. Be sure to subscribe to the Hockey Night in Canada podcast to get your fresh weekly episode. It's available on iTunes, Google Podcasts, Stitcher, Tune In or wherever you get your podcasts. It's not quite the American Electoral system, but the NHL awards still mystify fans who try to figure out how the ballots, candidates, votes and all the rest of the process actually works. Rob Pizzo and Sophia Jurksztowicz deserve a public service award themselves for shining light on the opaque business of picking the five most deserving players (and coach) of the regular hockey season. Terrible Ted Lindsay was one of the most talented, yet feared, players on the ice. He won the Art Ross trophy and four Stanley Cups with Detroit. But maybe his greatest achievement was off the ice, as the driving force behind the creation of the National Hockey League Players' Association.